[Jesus said,] "I have told you these things [about my going to the Father] before they happen so that when they do happen, you will believe. I don't have much more time to talk to you, because the ruler of this world approaches. He has no power over me, but I will do what the Father requires of me, so that the world will know that I love the Father. Come, let's be going." The principle here is tough. Jesus gives in to an enemy and then faces personal anguish, agony, and humiliation because he chooses to. Why does he do it? Why would he let Satan, who has no real power over him, do such horrifying things to him? Two reasons: First, he is honoring the will of the Father and showing his love for the Father. Second, he is doing it for us, as an offering for our sin — the reason the Father sent him to earth in the first place. 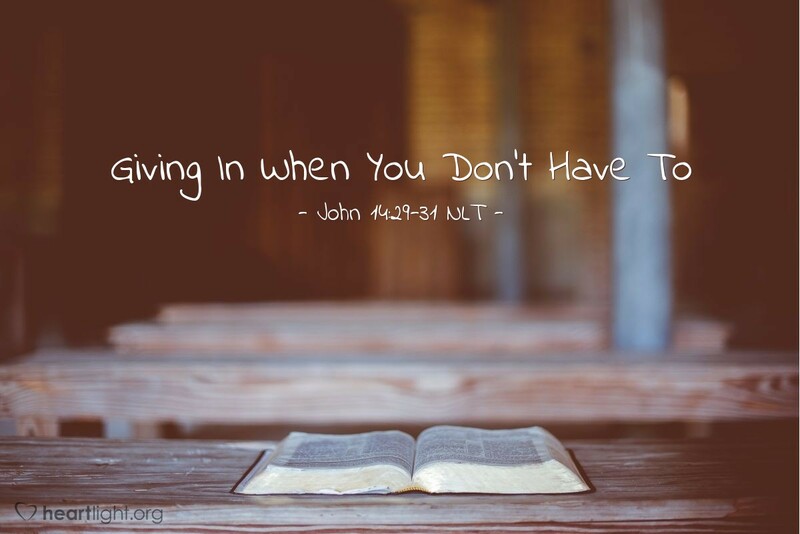 Jesus' example here is a tough one to follow — giving in when we don't have to do it. Why would we do it? For two reasons: First, to live obediently to God. Second, to spare others the heartache of sin. Father, I admit that Jesus' example is often hard for me to follow. When I am wronged or falsely accused, I don't want to give in. Sometimes, I don't even want to forgive but want to vindicate myself. Please give me spiritual discernment to know the difference between being a doormat that lets others needlessly walk over me and being redemptive. Please help me know when to give in on matters so that others are spared the heartache of unnecessary conflict as I try to honor you by being a person of character. Thank you, my Lord and Christ, for being willing to suffer abuse and injustice so that my sins could be forgiven. In your name, I ask for this wisdom and strength, and I offer my praise for heaven's grace. Amen.